Shhhh! Did you know that learning to play guitar at a basic level is actually pretty easy? And that with a few simple chords you can play tens of thousands of songs? This course is for those with little or no experience playing the guitar who want to learn the basics while having fun! Along the way, we’ll address some key questions of many beginning players. Am I too old/young/tall/short to learn to play the guitar? (No). Do I have enough talent to learn to play the guitar? (Yes). Will my fingers ever behave themselves and make an F chord? (Yes). Will I learn to play like Eric Clapton in this course? (No, but you’ll have fun anyway). You’ll learn some essential first position chords in several keys, and you’ll walk away with materials on additional chords and an understanding of how they’re used. We’ll work on strumming tone and rhythm. We’ll talk about guitar gear and how to use it, including picks, tuners and capos (the almost-like-cheating device that even your mother would approve of). We’ll learn some tunes to play with your new chords. Lastly, we’ll talk about next steps: how to participate in jams with your new guitar skills, how to build those skills further, and how to apply your new knowledge to all those songs you’ll be looking up on the internet. Murray started his music career with the accordion at age 6…and quit after a few months because of a tragic ignorance of zydeco music. He then took piano lessons for several years, but eventually quit because of a tragic ignorance of honky-tonk. Murray has been playing guitar since his mid-teens, and has never quit because guitars are awesome. Although the guitar remains his primary instrument, in the past few years he has added banjo, mandolin and ukulele to his repertoire, and has been known to pretend to play bass guitar. 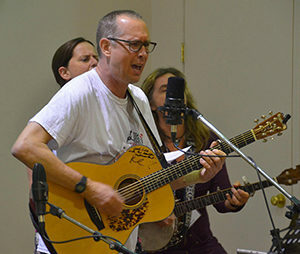 Murray has also recently started songwriting, and in 2017 placed first in the “Untapped” category of the Ship and Anchor songwriting competition. He also hosts a monthly song circle at the Gravity Café in Calgary. Murray has been a devoted FAMI attendee for many years.